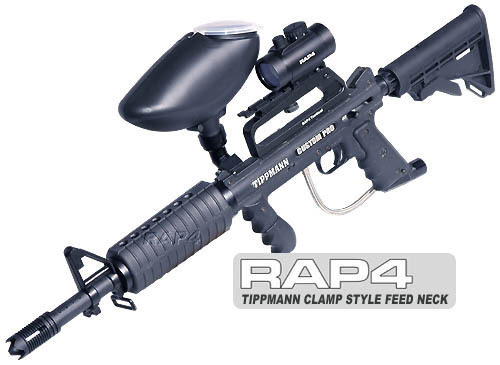 The Tippmann US Army Alpha Black paintball gun is a terrific marker for accepting upgrades and accessories. The carry handle makes a great platform for adding a rail and scope to; it’s also removable so you can add a scope directly to the top rail with ease. Your excitement for adding your brand new scope is quickly squelched however when you find out you can't see through it because the hopper impedes the view. The answer is the Alpha Black Offset Clam Style Feed Neck. The Alpha Black Offset Clamp Style Feed Neck is an upgrade that attaches easily to your gun and sets your hopper slightly off to the side for the clearest view from the top of your marker. With this easy to install accessory, you can add a scope to your marker anywhere you want and the hopper will never get in your way. 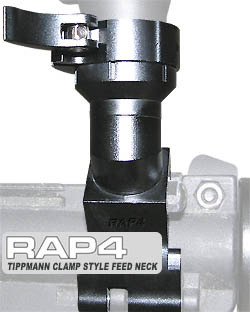 The feed neck that comes stock on the Tippmann Alpha Black paintball gun leaves much to be desired; without a clamp the hopper can easily come loose, especially with rough play. 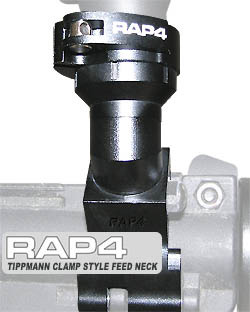 The clamp on the Alpha Black Offset Clamp Style feed neck closes securely around the hopper fitting, tightening the neck so it won’t move at all. This makes your gun and ammo supply much more secure for quick movements and fast action on the field. The Tippmann US Army Alpha Black Offset Clamp Style Feed Neck is also made out of 100% metal, unlike the stock hopper adapter that’s made out of a flimsy plastic. Attachment of this product onto your Alpha Black does require the hook from the factory hopper adaptor to attach correctly. Buy this quality upgrade for your Tippmann Alpha Black paintball gun for a cheap price from our online paintball supplies store. Our company makes it easy and convenient for you to get the equipment you need fast; we have numerous affordable shipping options and process orders immediately so you won’t have to wait to get this excellent product delivered directly to your door.